Updated Tuesday October 9, 2018 by El Campo Little League. 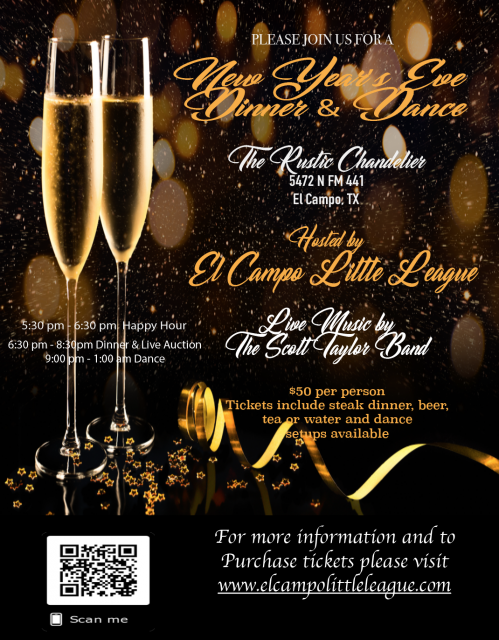 Come Join us for an evening out with family and friends as we bring in the 2019 New Year with the El Campo Little League's 1st Annual New Year's Eve Dinner Dance Fundraiser. Tickets are $50 each and include a steak dinner, beer, tea or water and dancing. Setups are available. Once tickets have been purchased we will send you the tickets by mail to present at the door the night of the event. Must have a ticket to attend. For more information please contact Pres@elcampolittleleague.com or any ECLL board member. Thank your for your continued support!!! !